…and has a large white fur pom pom at the top. 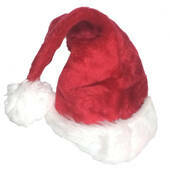 Get the classic Santa look for your toddler with this toddler sized Santa hat. Kris Kringle himself will be jealous of your great Santa hat. This plush infnat Santa hat features a red plush hat with a white plush trim and a white pom-pom ball on the top.